Smoked salmon slices marinated in Glengoyne single malt whisky. 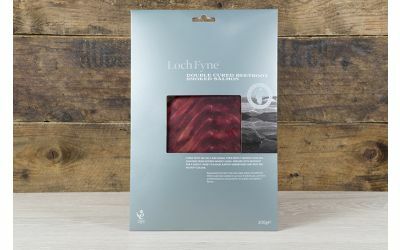 Our Whisky Marinated Smoked Salmon, winner of the Great Taste Awards 2015 2 stars, is cured in a mixture of sea salt and cane sugar then marinated in a specially selected 21 year old malt whisky from Glengoyne. The whisky has a smooth well balanced flavour, attributed to aging in sherry casks, creating a distinctive, subtle taste experience. 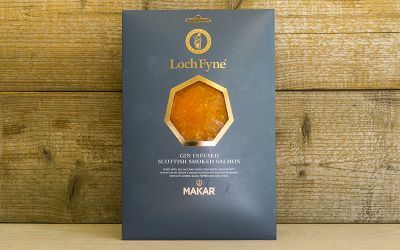 The salmon is then delicately smoked using shavings from retired whisky casks to add smoky overtones and complete the character of the product. 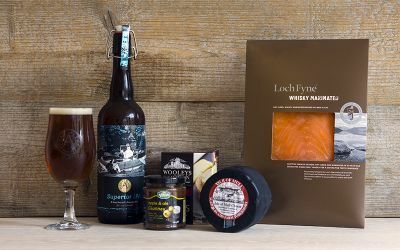 The smooth well-balanced flavours of Glengoyne single malt whisky are carried through to the smoked salmon as a satisfying undertone to the smoky characteristics that initially dominate the taste. 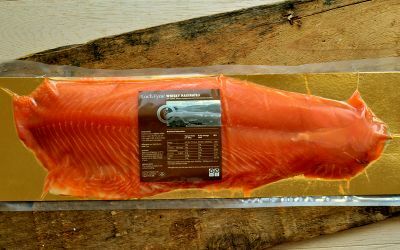 Scottish Farmed SALMON (FISH) (Salmo salar) 96.4%, sea salt 2.8%, sugar 0.8%, scotch whisky 1.5% (43% abv) (marinade).